Openness silences rumors. Chengdu city government has proved this adage again by holding five press conferences in three days in response to the bus blaze tragedy that took 25 lives and injured 76 last Friday. 8:02 AM, June 5. Among tens of thousands of people struggling to get to work during the rush hour, an unfortunate group who took Bus No.9 on its way from Tianhui Township to downtown Chengdu would never make it. 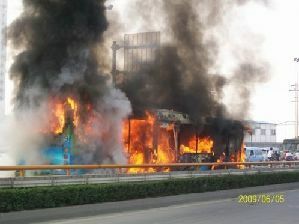 The bus caught fire while passing under the Chuanshan Viaduct. Smoke blackened the sky and the smell of burning blanketed the whole street, said a witness. How many passengers were killed or injured? What was the cause? Was it a terrorist attack? Such questions were on everybody's lips as the news of the accident spread. 10:40 AM, June 5. Two hours after the incident, Chengdu city government held the first press conference in an adjacent office building. City government secretary-general and spokesperson Mao Zhixiong announced that at least 20 passengers had died and many more were injured. The cause of the fire was still unknown and under investigation. Before that, the city government had already sent out four teams – a medical team, an investigation team, a post-disaster care team, and an open information team, and conducted a rapid city-wide security check. 14:50 PM, June 5. The second press conference revised the death roll to 25 and announced the number of injured at 76. "The city will use its best doctors, facilities, and medical care, and do its best to save the injured," officials told the press conference. They promised quick and timely disclosure of accurate information about the case. They also refuted the rumor that the bus driver escaped from the fire and ran away, but instead specified that he had "called on onlookers to join in the rescue". 16:00 PM, June 5. Traffic at the site was restored to normal. Except for few pieces of glass scattered around, the accident site had been cleaned up, leaving small groups of residents still gossiping about the tragedy, according to a Guangzhou Daily reporter. Thanks to the internet, videos and photographs of the incident had already appeared on some websites, giving rise to the question whether the bus had been equipped with emergency hammers, and rumors that someone had smelt petrol fumes, called on the driver to stop, and been ignored.